A great way to cook salmon, especially if you don't want to add a lot (or possibly any) fat to it, and love not having a ton of cleanup to do afterward, is to cook it in foil. 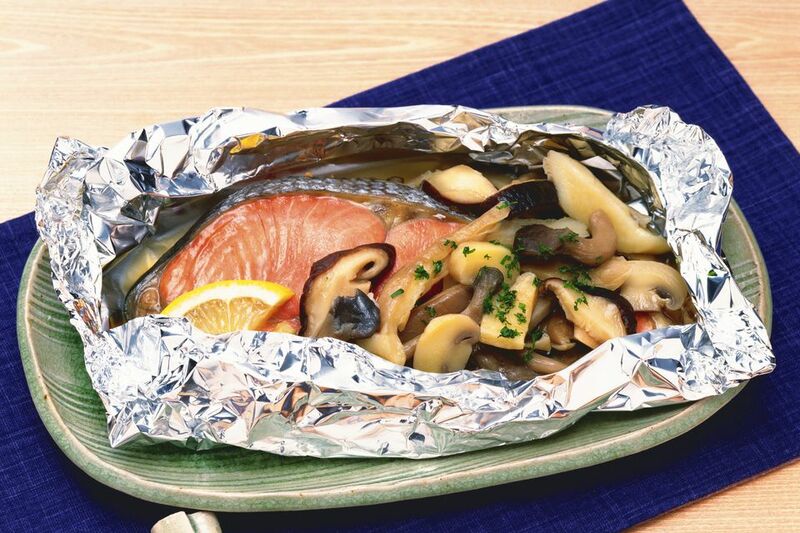 Cooking salmon in foil is a way of steaming it. How that happens is that, after seasoning your salmon, you seal it up in a foil pouch. When you heat it, which you do in a very hot oven, the fish cooks by way of the steam that's released from the salmon itself as well as any vegetables, citrus and fresh herbs you might (and should) add to the pouch. Not only will the salmon not dry out, it will produce a flavorful sauce as its juices collect in the pouch along with those of the accompanying ingredients. I know I said low or no fat, but obviously a little blob of butter or splash of olive oil will make it better. But the point is, it's optional. This technique is a variation on the en papillote method that's been around for a long time and involves cooking the salmon in a pouch made of parchment paper. Traditionally, a solemn waiter would deliver your salmon en papillote to your table still wrapped in the paper, and with grave ceremony, slice open the pouch right before your eyes. Of course, you don't have to serve it in the foil. But remember what I said about cleanup? You don't have to take it out of the foil, either. Note that you can use parchment paper instead of foil. You're more likely to have foil than parchment paper. It's also easier to crimp and less likely to leak. Also if you intend to serve it in the manner described above, parchment paper is certainly more elegant than foil. An entree that arrives wrapped in foil—even the very finest foil—tends to evoke dining at The Sizzler. On the topic of fine dining, I should mention that the papillote technique I use is one I picked up in restaurants, and includes a step that I think many recipes leave out. I happen to think it's a useful one. We'll get to that in a moment. But it does have to do with heat. I mentioned a very hot oven, and by that I mean 450 F (or 420 F if you're cooking with parchment paper rather than foil). The reason we want the oven nice and hot is that steam is generated more quickly at a very high temperature. If we started it on warm, it would heat up more gradually and the steam would be produced more slowly. This cooking method produces a lovely pool of rich and flavorful liquid. You can pour these juices straight over your fish, or you can thicken it up a bit first with a roux or a simple cornstarch slurry. Or simply stir in a little bit of butter, a liaison technique known as monter au beurre. Note that other than the lemon, everything is chopped. The reason for that is twofold. One, chopping the items helps to release their liquid. And two, for the sake of appearance. It can be disappointing to open up the pouch and see the long wilted fronds of dill you sealed up in there minutes earlier. It's as if your hopes wilted right along with it. You can cook either salmon fillets or salmon steaks this way, but if I may impart just one piece of wisdom to you, it's that life is too short to spend even one more minute of it pulling fish bones out of your mouth. So skip the steaks and stick with fillets. Preheat your oven to 450 F (or 420 F if you're using parchment instead of foil). Also heat up a dry skillet. I like cast iron, which takes longer to heat up, but it heats evenly. Pull out a piece of foil about 14 inches long. Brush one side with olive oil or melted butter. This will help prevent sticking. Place your salmon fillet on one side of the foil. Brush with olive oil or melted butter. Season with Kosher salt and freshly ground white pepper. Spoon the chopped shallots, fennel, parsley and dill across the top, and top with a slice of lemon. Now fold the other side of the foil over loosely, and bring the edges together without pressing the foil down over the contents. The idea is that you want to be able to crimp the edges to seal the parcel while still leaving an air pocket around the fish. Crimp the edges by folding them over. Now here comes the additional step hardly anyone uses: Set the parcel on your hot skillet and let it get hot for about 1–2 minutes. Why this works: The direct heat from the skillet helps generate a big burst of steam. With parchment you can see the paper start to puff out, which means it's time to put it in the oven. Foil doesn't puff out quite as much (if at all), but two minutes on a hot skillet should get the steam going. Now transfer the parcel to your oven, directly onto the center rack. Bake for 6–8 minutes. Cooking time will depend on the size of your fillet. Another nice thing about this method is that the fish will stay nice and warm even after you take the parcel out of the oven, in case you have other matters to finish up, like making a nice pilaf to go with it. When ready to serve, open up the packet and serve with the accompanying juices (or fortified, as discussed above). Obviously, this technique will work with fish other than salmon. But salmon is great because it's so easy to work with and extremely forgiving of any mistakes you make. Not that you'll make any. Other than, if you forget to take it out of the oven. Another thing is, I mentioned the microwave earlier. And of course, you cannot put foil in the microwave. But if you get yourself a roll of actual parchment paper (it will come in handy for so many other things), you can use that instead of foil, and then you CAN prepare this dish in the microwave. Literally just zap it for 3–4 minutes. And you can skip the skillet step if you do it this way. Lastly, experiment with other vegetables. Like whatever is in season. Young zucchini can be nice in early summer. Mushrooms are good too, especially shitakes. They add a nice umami depth to the sauce. But a word of warning: Mushrooms are loaded with water, which is great for making steam. But if you don't cook them all the way, they can turn out a bit squishy. And a few minutes in the oven isn't always long enough. So, I'll often sauté them in a pan first, so that they're about halfway cooked, then add them over the top of the fish and seal up and proceed as per usual. When I'm combining salmon with shitakes, I will sometimes add just a dash of soy sauce and perhaps a teeny splash of seasoned rice vinegar and sesame oil. The beauty of this is that you can use pure sesame oil, which burns easily so it's no good for sautéeing. But when you're cooking in foil, the oil can't burn because it never gets hot enough. Enjoy!